I’ve been using Curology (previously known as Pocketderm,) an online dermatology service for almost one year and I’ve had several people ask me about it on Instagram, so I thought a blog post would be helpful. I have many thoughts about it and it’s just too many words for Insta. Before I get into it, this is not an easy thing for me to talk about and especially not an easy thing for me to post my photos on the Internet (My IRL friends can probably guess that I’m nervous about this post, because I’m a very private person. Eeek.) It’s only pictures of one side of my face, so not a big deal right? But, it’s my skin at it’s worst, just bare with no makeup. I never intended for these photos to be seen by anyone other than me, so the lighting isn’t the same and the quality could definitely be better. They’re simply photos that I took so I could track my progress. Just keep your eyes on the zits, not the lighting is what I’m saying. LOL. But, seriously, I’m sorry that the photo quality is not better. I also want to mention that it was a combination of things that helped get my acne under control. The Curology service and medication is a big part of it, but my Asian Beauty routine and changes in my diet were also big factors and I will likely post about them at later date. I discovered Curology through the wonderful Skin and Tonics blog. I’d been back doing the AB routine for a while, after many years of trying different routines, and had been following Kerry’s blog for several months by then. I’ve had experience with dermatologists, but I would always get the same recommendations. I felt like they weren’t really listening to my needs and merely writing me prescriptions for Retin-A or Tazorac and sending me on my way. Those meds would always tear up my face by completely drying out my skin and not only did they not help my acne, but would oftentimes cause me to breakout more. I needed a different approach. By the time I had read the Skin&Tonics review on Curology , my skin was at a really low point. It had been about two years since I had my 3rd child (my son) and my breakouts were awful… (Pregnancy always sends my skin on a downward acne spiral. YAY, babies. BOO, acne.) 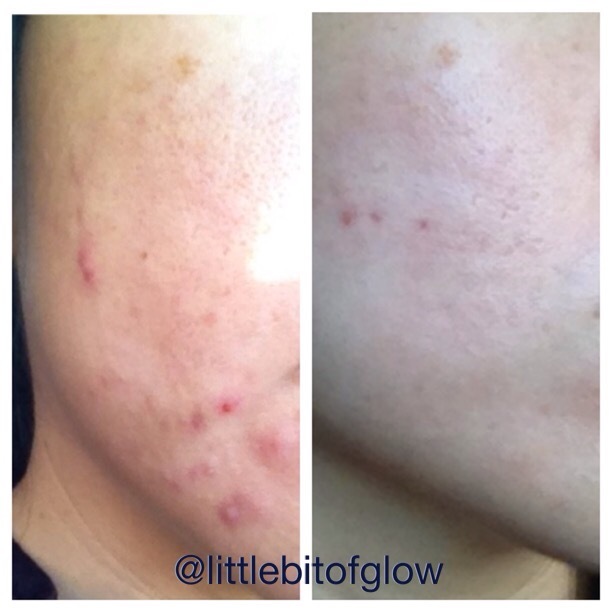 My face was rough and dull, with lots of acne on the lower part of my face and on my neck. Every morning, as I’d wash my face, I’d feel new, acne cysts under my skin. It felt like a neverending cycle and was incredibly frustrating and disheartening. It not only looked terrible, but the acne felt terrible. My face hurt! I had made changes to my skincare routine by that point which helped a small amount (like, the Benton Snail Bee Essence sped up the healing process), but nothing stopped the acne cycle. I signed up for the Curology service in early November 2014. I sent in my makeup-free photos, completed a brief questionnaire and included some comments about my previous medications. I received a response from my online dermatologist the following day. My online derm noted my previous negative history with Tretinoin (that I had mentioned in my comments! ), so he recommended a combination of Clindamyacin, Azelaic Acid and Niacinamide as a first go and they shipped it out that day. I received it less than a week later- everything moved along very quickly. The medication has a creamy base, but it’s a lightweight cream and not greasy or heavy. I used it every night after my essence step and started noticing improvement after four weeks of use. Fortunately, the medication really agreed with my skin and I didn’t experience any irritation or dryness. The photo below is my best attempt at a Before and After, using the best of the photos that I still have available. The picture on the left was taken before I started Curology. I began using the Curology medication in November 2014. The photo on the right was taken in June 2015. So, this was after seven months of consistent Curology use. It is hard to tell in the After photo, but my skin is a lot less bumpy. Actually, it has no bumps. I still have some visible acne spots that are healing in that photo, but my skin is a lot more even toned, less red and not lumpy. There is no active acne there, and no new acne spots brewing underneath the surface. I remember the first morning that I washed my face and noticed that I didn’t feel any new acne cysts/lumps underneath the surface and thinking, OMG.WOW my face is smooth! My skin is still not where I want it to be, but I’m so glad that I took the plunge and tried Curology. It’s helped my skin so much and their customer service is amazing. They’re very responsive and I can really tell that my online derm is reading my inquiries and comments, and keeping my concerns in mind when he makes recommendations. My only regret in all of this is that I waited so long to sign up. Seriously! Kerry’s review went up in August and after I read it, I had a million excuses for not signing up and just dragged my feet. Three months later, I finally signed up. I’m kind of notorious for being a slow poke/procrastinator, but I’m kicking myself now for waiting. But, better late than never, right? If you are like me, and procrastinating and dragging your feet right now, it’s incredibly easy to sign up. I love being able to email my online dermatologist with any questions I have about my medication or my skin, in general. If you want to get your first month of Curology for free, you can use my referral code here. It is $19.95 per month and they offer a 90- day unconditional money back guarantee. The monthly fee includes your online consultations AND medication and shipping costs. They also offer anti-aging formulations and I’m looking forward to trying that option out, eventually. I hope this was helpful to anyone out there who is also struggling with problem skin and for whatever reason, is looking for a different approach in treating your acne. 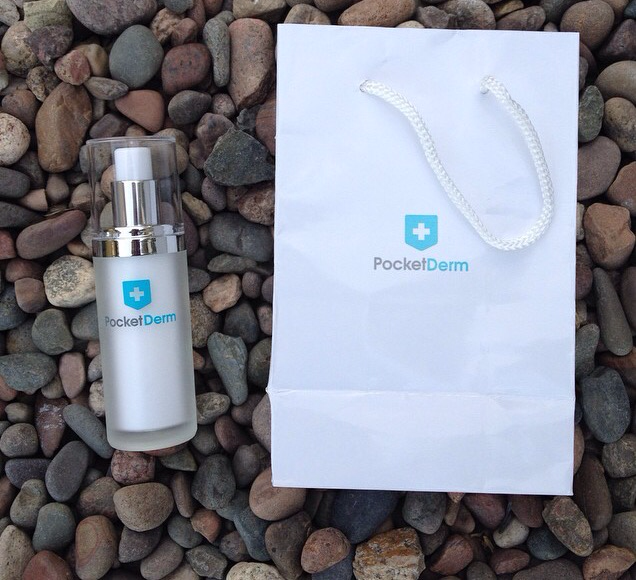 I also want to say thank you to Kerry for posting about Pocketderm/Curology in the first place. You are one of my online skincare saviors, XOXO! If I missed any details, let me know in the comments. I’m happy to answer any questions as well! Thanks for this posts. When you took this picture were you still using Curology or were you done? I’m considering it but I wondering if I will have to keep using it if I want my skin to be clear or if I can stop using it once it’s clear. Hi, sorry for the late reply! When I took the After photo, I was still using Curology, but a few months later, my prescription didn’t seem to be enough to fight my acne. So, I requested a new formula. The new formula contained Tretinoin, but my skin really didn’t like it (caused a lot of peeling, irritation and increased acne, even!) I used it for probably 4 months, then stopped. After that, I used the new formulation maybe once per week and then finally stopped altogether. But, at that point my skin was in much better shape anyway, so I felt like it wasn’t worth all the fuss with the Tret side effects. I’m actually thinking about going back on Curology but under their Anti-Aging program. As for your question, I guess you can wait and see how your skin reacts to the new treatment. Hopefully, it helps and clears up your skin and you can stop using it and see if the acne returns. It’s really hard to say since everyone’s skin and lifestyle is so different. Another thing to consider in acne-fighting is your lifestyle, especially diet/nutrition. I found that dairy really makes my face explode with acne. Once I eliminated dairy, my skin improved a lot. The Curology and a good skincare routine really expedited my skin’s improvement. I’ve also read that cutting back on caffeine and sugar can help, too, but I’m not brave enough to give up caffeine. Another thing that has helped improve my skin is eating more fruits and vegetables and eating fewer processed foods. Not fun, but it’s worth it, haha. I hope this helps!